Every day, Watch This offers staff recommendations inspired by a new movie coming out that week. This week: Prepare for Dracula Untold with some of the best of Dracula already told. In 1930, two versions of Bram Stoker’s most famous novel were shot concurrently, on the same sets with the same script—one during the day and the other at night, one in English and the other in Spanish. 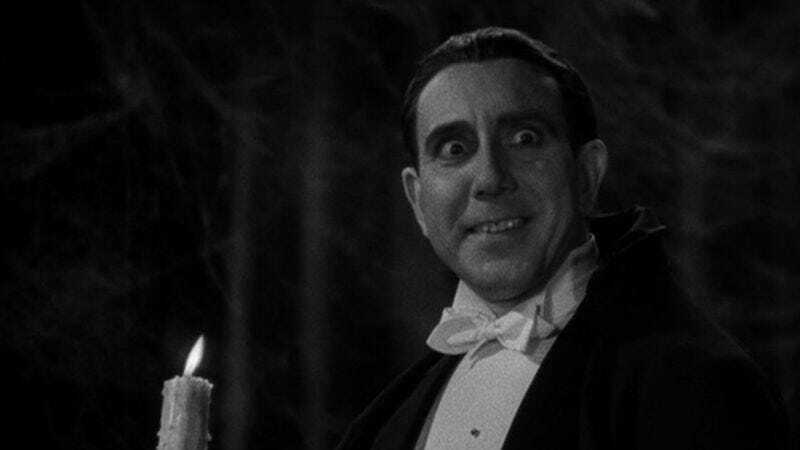 The English version, Todd Browning’s Dracula, remains the most popular cinematic adaptation of the story; for many, the (Universal) monster’s name conjures nothing more or less than the image of Bela Lugosi, draped in regal black, waxing poetic about the creatures of the night. The truth, however, is that the shadow Dracula—the cheaper and lesser-known version, the one performed entirely by Spanish-speaking actors in the wee hours—is actually the superior movie, in mostly subtle ways that only become clear when the two are watched in succession or (even better) viewed side by side. It’s possible that filming this largely nocturnal material during a genuine graveyard shift brought out the proper spirit in everyone involved. Certainly, there’s a liveliness here that’s noticeably absent from Browning’s stiffer interpretation. In an introduction shot for a decade-old DVD release of both Draculas—they were packaged together as part of Universal’s Legacy Collection—star Lupita Tovar (who plays Eva, the Mina character) notes the difference in acting styles, championing her cohorts’ more emotional approach over the “subdued” performances of the English-speaking cast. She’s not wrong, but the more notable differences lie in visual execution: Privileged with the ability to study the dailies of their rival production, director George Melford and his crew conceived of more dynamic angles and ambitious stagings, effectively transforming the set (and blueprint) the filmmakers shared. Look, for example, at the two versions of Dracula introducing himself to Renfield, both of which are excerpted below. Whereas Browning depicts the Count walking slowly down the stairs and finally hitting his mark in front of the enormous spider web, Melford cuts away to some fluttering bats that grab Renfield’s attention, and then cuts back to a tracking shot up the stairs that dramatically reveals Dracula. Melford also manages to get a shot of Renfield’s face through the spider webs—a nifty way to foreshadow the character’s inevitable entrapment by this undead predator. Scene for scene, the Spanish version one-ups its “competition,” at least from a purely aesthetic perspective. But as the clips below also illustrate, there’s one aspect of Browning’s movie that Melford couldn’t quite match, and that’s the otherworldly menace of Lugosi’s performance. Carlos Villarías, who played Dracula in the Spanish version, was instructed to mimic the mannerisms of his counterpart; it’s a decent imitation, but no patch on the beguiling strangeness of the real deal. Lugosi, who didn’t speak English at the time, is said to have delivered his lines phonetically—an approach that lends his Dracula an alien quality. To toss out Browning’s less robust adaptation is to deny oneself the pleasures of its star-making lead performance. Thankfully, both versions exist; you don’t have to choose between them, even if we have. Availability: The English-language Dracula is available on Blu-ray and DVD, which can be obtained from Netflix or your local video store/library, and to rent or purchase from the major digital services. The Spanish-language version is included on the Legacy Collection Dracula release and the Dracula Blu-ray.